These standards require practitioners to engage in the steps that lead to professional learning to improve their teaching, and to ensure that all interactions with the various people surrounding the classroom are conducted in a professional and respectful manner. On my final practical I was rated as outstanding in all areas of Professional Engagement. In terms of my attitude and practice towards reflection and professional learning, I view this as a necessity in this highly complex and demanding profession, and am passionately interested in becoming a good teacher. With regard to my relationships with others, I have conducted myself with enthusiasm and professionalism, and have pushed myself to become a comfortable social and work related participant of each of the working teams I have been privileged to become part of in being a student teacher. I have consistently been commended for my determination to build in feedback from my teaching into my very next lesson. This has enabled me to grow quickly, as experienced practitioners have advised that I have needed to, and to come to understand my strengths and weaknesses well. Having said this as a new teacher there is also a place for my own take on teaching, and I recognise that sometimes I will want to do things differently to the way others might do them. 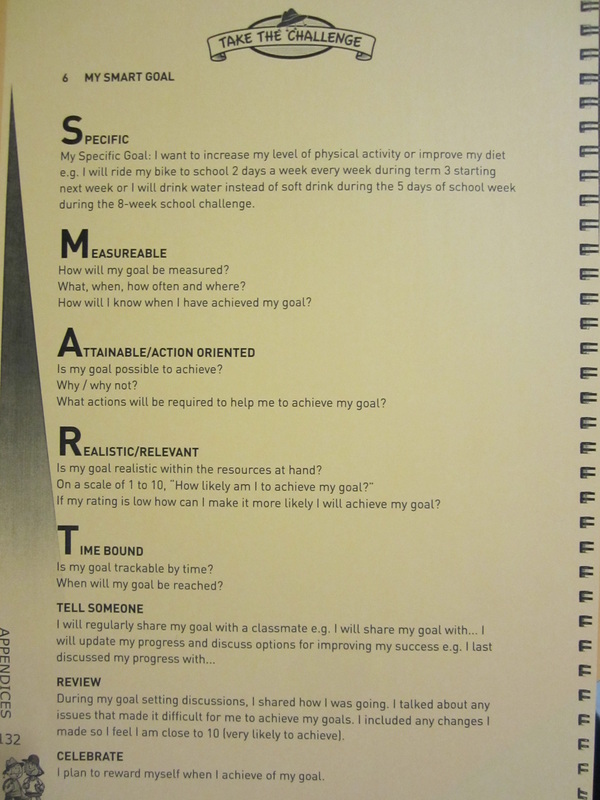 On my internship I kept a daily reflection log, and have developed a growing collection of resources, such as a series of management documents that detail my classroom management options, and my thoughts on these skills. I have started to look at the professional development that is available, and will sign up for a cyber-safety PD I have come across that will be held in late November. I have identified this as a particular area that I would like more understanding of, as next year I will likely attempt a class webpage, complete with a class blog with appropriate limitations. 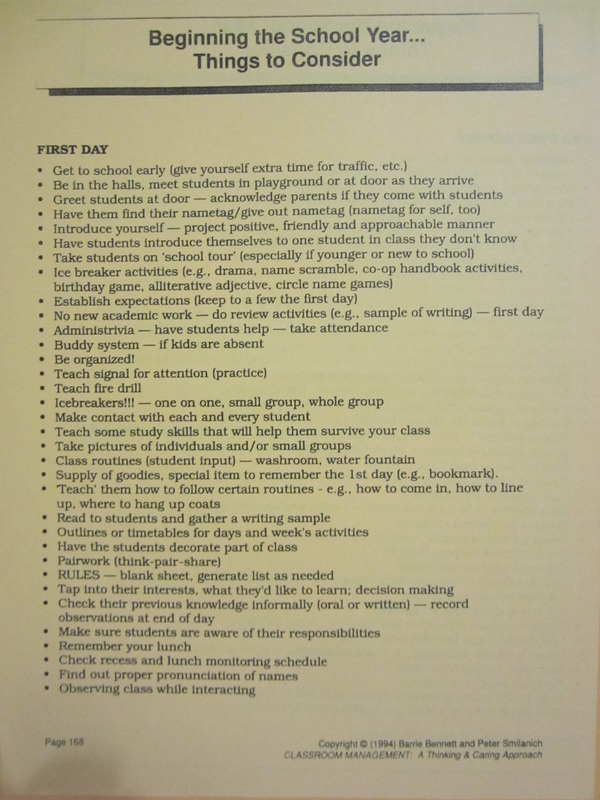 As evidenced by the 'beginning the school year' lists (Bennett and Smilanich, 1994) (AITSL focus area 6.1, see below), I am starting to collect information that will help me with the coming challenge of teaching. 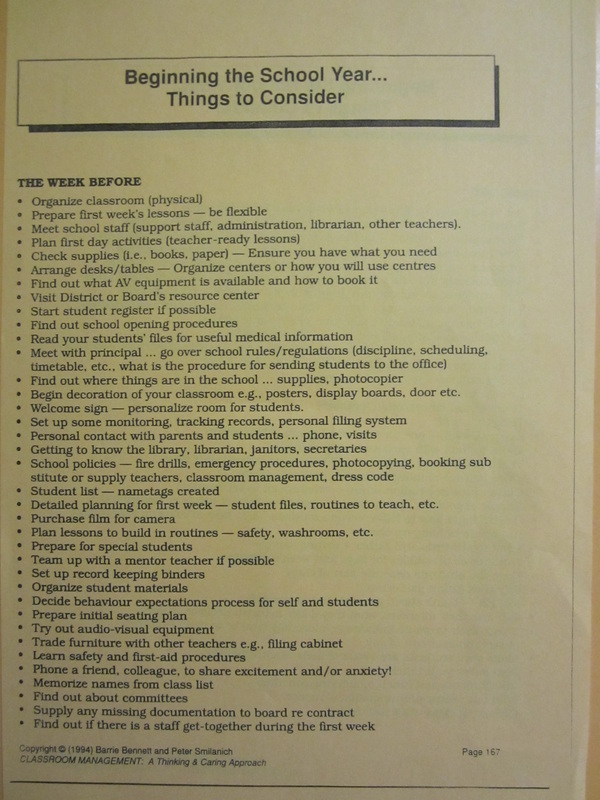 As a great start to a checklist of what I will need to do, I'm sure I will need to add many other things to this list. 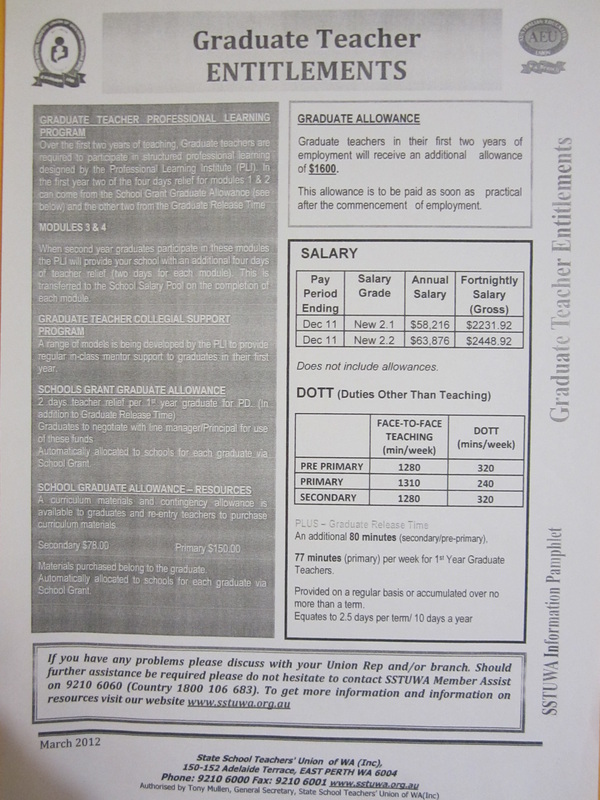 New graduates are entitled to much assistance in order to get them going (SSTUWA, 2012), and I will hopefully use some of my extra DOTT time to take part in classroom management development options. I will also be sure to continue membership with SSTUWA. 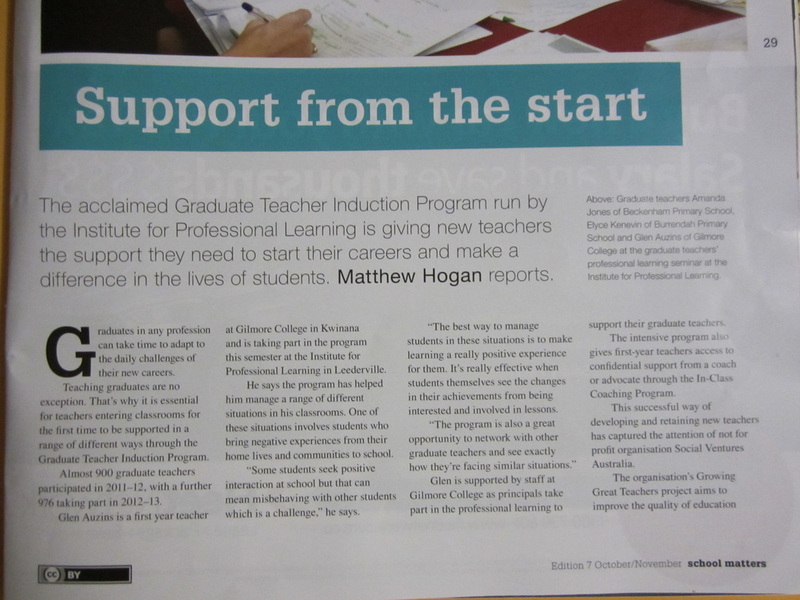 I have found a good evidence guide (Queensland College of Teachers, 2013) that will be useful in making the transition to full teacher registration, and I have found a good article discussing the Graduate Teacher Induction Program by the Institute for Professional Learning (see below) (School Matters, 2013). 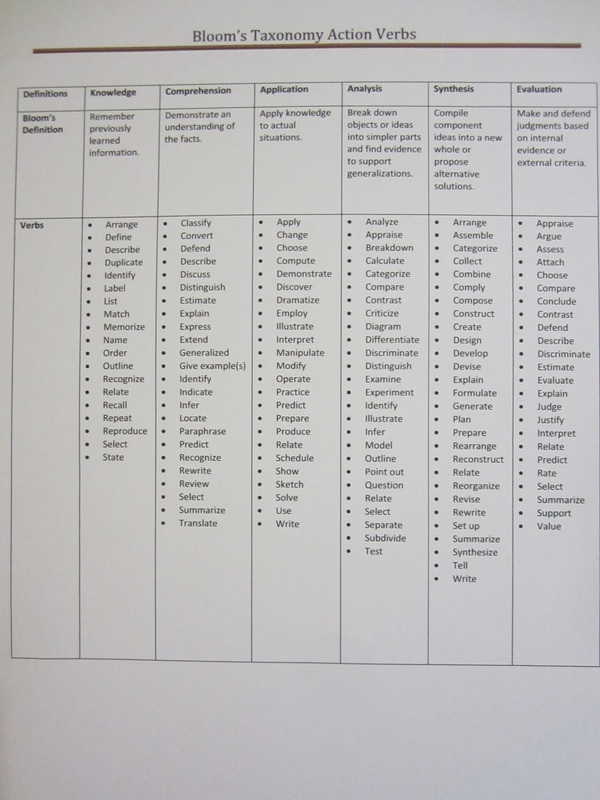 Other things I would like to work on from my practice include further understanding and use in class of Blooms Digital Taxonomy, and utilising reflective journals for some work subjects, as this worked very well for my students with our Mathematics content. 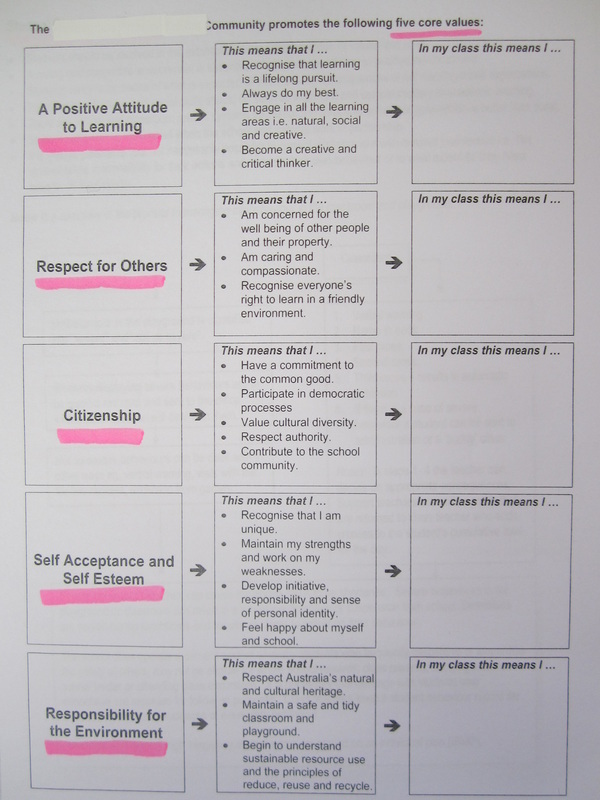 Examples of my engagement in professional learning so far include attendance of a workshop on West Australian heritage by the National Trust of Australia (WA), a PD on oral language ideas, and a valuable series of classroom management workshops by the Department of Education and Training. 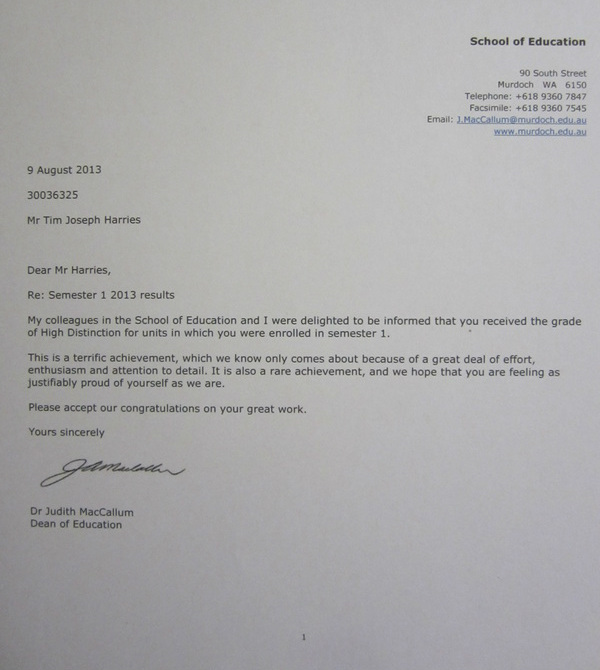 In completing my Graduate Diploma of Education I have had an enormous amount of professional growth, and although I have not done perfectly, I am proud of my efforts in what has been a very demanding course (AITSL focus area 6.2, see letter regarding my results below), and which has at many stages emphasised the practice of reflection . This website will be an ongoing part of that reflection. 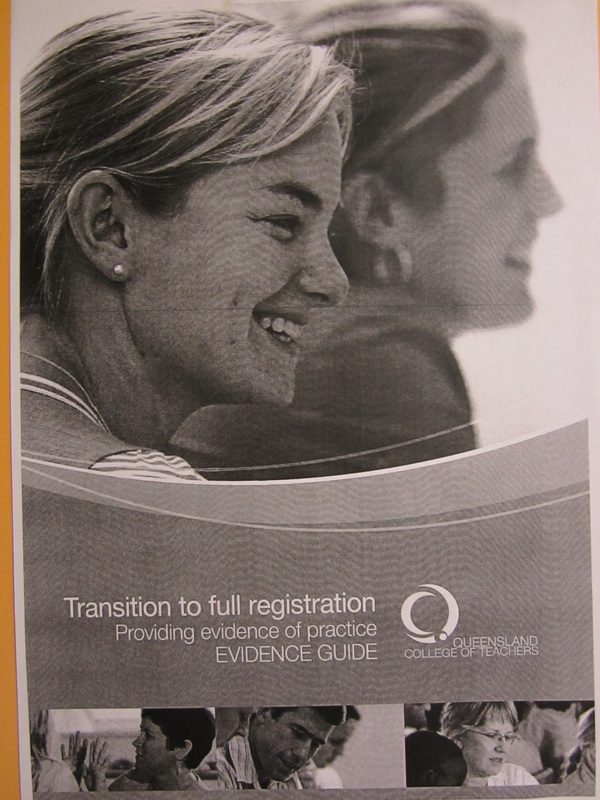 For example I was introduced to the Take the Challenge Health Program (DET, 2013b), which I will consider implementing next year. I was congratulated on my professional approach to my internship, conducting myself with professional integrity at all times, fully collaborating and mixing socially with staff, and adhering to existing school policies. I have had positive interactions with many parents across my practical experiences, and have also engaged with parents as a participant in the school P&C where my children attend school, and where I have assisted with fund raising activities, including coordinating a father's day breakfast for the whole school last year. 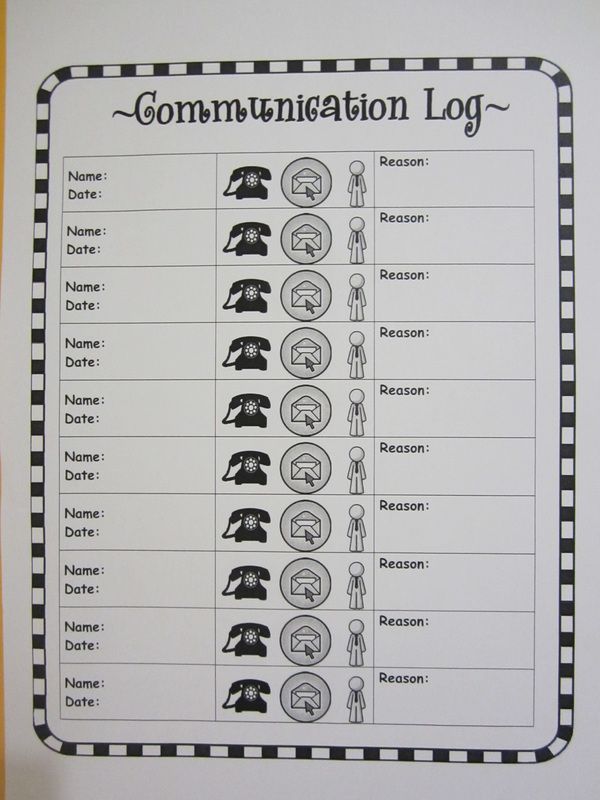 I formed some strong bonds with the parents I met and I will utilise products like a parental communication log to keep track of my interactions. As a man who believes in being ethically responsible, in particular with regard to respecting the environment and human rights, I took my duty of care seriously in my teaching. 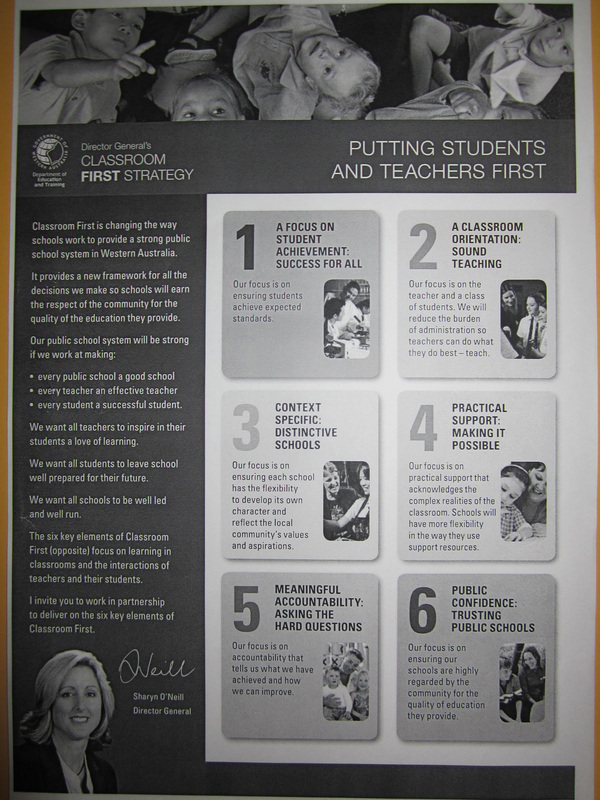 I strived to represent the school core values (AITSL focus area 7.1, see below), and will work collaboratively to represent the 6 key elements of the DET Director Generals Classroom First Strategy (DET, 2013c). I have also engaged with the broader community. 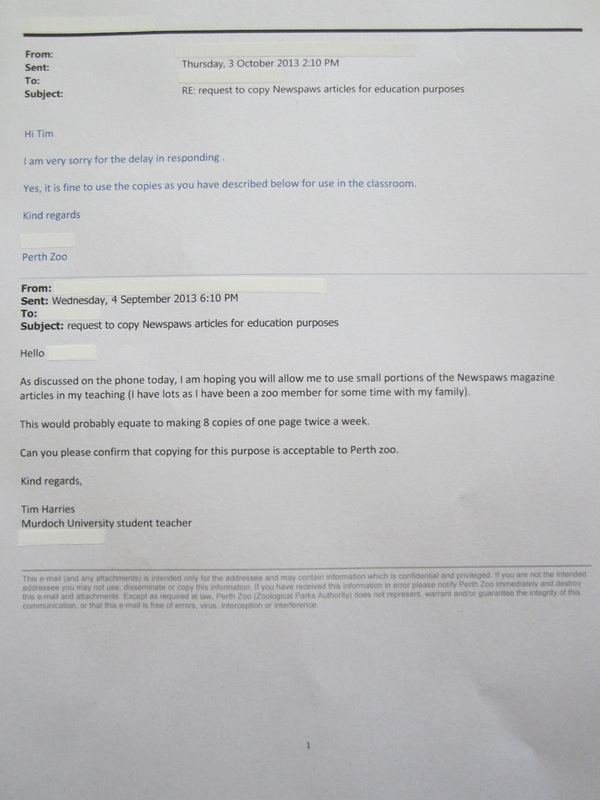 In order to conduct my reading comprehension activities based on the News Paws magazine, I needed to make laminated copies of several articles, and so as to not infringe on copy write, I approached Perth Zoo, and obtained permission to utilise their materials for my teaching (AITSL focus area 7.1, see below). This will now be useful for any further activities of this kind, and I have now made a good contact at Perth Zoo. I have collaborated fully with fellow teachers, my recent practical situation requiring consideration of the class next door, as our classes were actually in the same room, only separated by a less than eye height divider. I also recognise that at times I will be required to share my teaching environment with Education Support Staff and have had a very positive experience with this on one practical. Finally I am very keen to collaborate with other Science professionals and look to assist my new school by establishing valuable links in order to gain in Science expertise. My action plan for Standard 6, Engage in professional learning, is to attend the cyber-safety PD, become a full member of SSTUWA, during my new graduate DOTT attend Institute for Professional Learning classroom management courses and to seek a strong mentor, from the school, or from DET. I want to start utilising reflection checklists and participant observation in my practice, would like to explore Bloom's taxonomy and the Take the Challenge Program, and possibly start a diary for reflection. Having said this, my highest priority action will be to learn the routines, policies and methods of my new school, further utilise this site, and ensure that I do not take on too much as a new graduate. My action plan for Standard 7, Engage professionally with colleagues, parents/carers and the community, is to engage with parents early, possibly holding a shared parent teacher night with another teacher, and requesting early involvement with lesson activities from home. My plan to establish links with Science professionals is going well, I have developed an exciting relationship with a Science specialist at a Primary School and will work hard to make the most of this. I will join a working group committee next year, probably Science, and will seek to redo the father's day breakfast at my children's school.